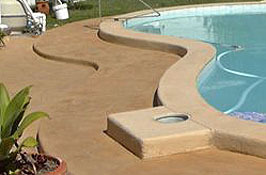 There are pools constructed with a reinforced concrete shell that have been lined with a fiberglass layer. 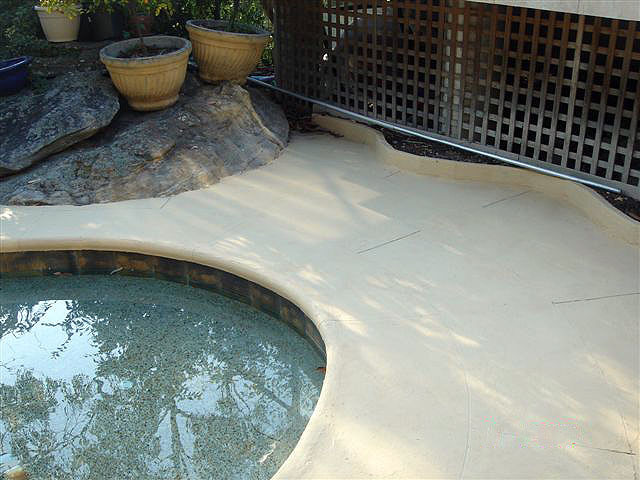 The fiberglass layer is often applied some time after construction such as when the concrete has become worn, hard to keep clean, has cracked or for some other aesthetic reason. There are also instances when the fiberglass layer was applied soon after construction as part of the original design. The fiberglass layer may now be looking tired, dirty, have algae attack, may have delaminated in parts and even worn through in some places. It can be upgraded successfully by using Epotec Hi build epoxy however there are some important issues to discuss before carrying out this work. The first issue relates to the condition of the fiberglass. If just looking a little worn and tired, but still well adhered, this makes it quite straight forward to deal with. However usually we find that there will be areas where it’s completely worn through and may be missing larger pieces. Also there may be areas where it’s still continuous membrane but has become unattached to the concrete below. Any moldy and general dirty areas can be easily addressed as part of the surface preparation. Many issues will not be easily understood until the pool is empty. It therefore needs to be said such pools must to be approached with care. Often some areas of fiberglass will come away easily and others will remain very hard to remove, if at all. Usually it will be necessary to remove the fiberglass where possible and replace OR feather edge the bigger patches leaving clean, bear concrete, fill any remaining holes with epoxy and hope the remainder of the fiberglass that is currently well adhered remains so. Ideally, ALL fiberglass needs to be removed no matter how well adhered. 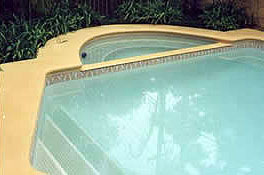 There after Epotec which is a hi build epoxy coating specially formulated for use in pools, will provide a seamless, hard wearing coating for 7 – 14 years. It’s applied in 2 coats and requires only 5 – 7 days curing. It may be applied to damp (but not wet) surfaces and will bond permanently with a clean, stable surface. Though its 2 pack is easy to use and has ample working life for a good result.